Semi Homemade Cherry Pie is a decadent dessert any time of year but at the Holidays it’s hard to beat! You’ll love how simple it is to make AND that’s a win-win in my book! Combine reserved cherry juice and cornstarch in a small bowl, stir until smooth. Pour cherries into medium sauce pan, cut each cherry in half. Over medium high heat, add sugar and lemon juice to cherry halves. Bring to a boil, add cornstarch slurry, and boil for 3 minutes to clear the starch. In a medium mixing bowl combine oats, flour, sugars, and cinnamon; mix to combine. Cut in butter with a pastry cutter or 2 knives until pea sized. Assemble pie by placing pre-made pie crust into 9 inch pie pan, crimp edges or shape into a ruffle (like photo). Pour filling into crust and evenly spread topping mixture on pie filling. Bake 45-50 minutes. Check at 25-30 minutes and cover crust with foil if getting too dark. 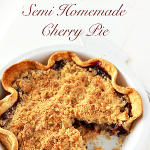 Semi Homemade Cherry Pie is the perfect combination of homemade taste without the mess and time of making a pie crust! I hope each of your Holidays are Merry and Bright! Oh, and filled with lots of delicious baking too. 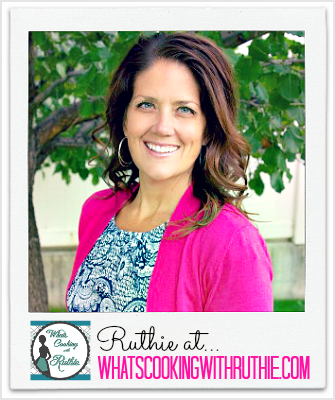 I love all your recipes Ruthie. They all look so pretty and delicious! Looks delicious! The pie crust is gorgeous! Ruthie!! You are killing me with all of this deliciousness! Pinning!! Ruthia and Desiree, that pie looks amazing – and so do all of the other beautiful sweets! Wow! The Creme de Mint Pie is kind of calling my name! 🙂 Thank you, lovely ladies, for sharing these amazing sweet treats, because we can never have much sweetness at this time of the year! Pinning! Hope you both have a super sweet and merry day! Hugs!